14 months ago, my fiancé and I moved to Berlin, and it’s been pretty awesome, frankly. It’s cheap to live, it gets PROPER winters, with SNOW that hangs around for AGES, but the city somehow copes and keeps the trains running, the food is decent, and I can walk to work in 25 minutes if the mood takes me. It’s the first place I’ve lived for any length of time other than London, and it’s great. But alas, stuff ends. For personal reasons, we’re moving back to London in the first week of April, leaving behind Berlin, a nice flat, a lot of good friends, and a really decent Thai curry place that I hold an unassailable mayorship on (11 checkins in the last 2 months). We haven’t been to London in more than a year now, so this may be a little weird*. 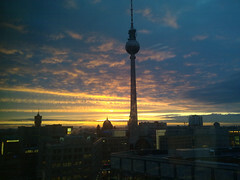 Leaving Berlin also means leaving my job. I’m looking for a new one, ideally one where I can work in a small team, in person, and ship interesting and beautiful things. I’m not too picky about programming language, and I know how to scale things and the sorts of things you haven’t thought of yet that’ll hurt you. I have a CV and a portfolio and a github repository – all the usual stuff. Contact me if you have anything interesting. * Looking forward to that first Shepherdess, though. It was really really cold when I arrived. But recently it’s been a lot warmer. Very nice, in fact. I’m living out of a suitcase because my stuff is being held in storage till I get a house, so I’ve been having to buy more warm clothes, but apart from a day of snow earlier it’s been pretty decent. Lots of smokers here. Even indoors. It’s weird. And annoying, as a smoky bar means that I write off half my wardrobe. I get phone service on the U-Bahn. This is awesome. I haven’t been somewhere without phone service in days. This is beginning to give me a rather blasé attitude towards offline caching. Living here is a lot cheaper than London. I found a place to live that’s about 80m2 in the middle of the city for less than I was paying for a shoebox 45 minutes from the centre of London. But then, most places are cheaper than London.. I can’t pronounce words. This is more debilitating than merely not being able to speak the language. I know I can’t speak German, but as it stands I can’t even read things off menus to order food, or pronounce street names to taxi drivers. I’m reduced to pointing at words on bits of paper. I’m sub-literate in this country. Have to work on that one.